Alaska's Native people are divided into three ethnic groups, eleven distinct cultures, speak twenty different languages with more than 50 dialects, live in eight geographical locations in Alaska, in more than 200 villages and communities, and make up nearly 20% of the total population of Alaska. There are three types of Alaskan Natives with different ethnic, cultural and linquistic history. They are Indian, Eskimo and Aleut. The terms “Inuit” and “Native American” are sometimes used in place of “Eskimo.” In Alaska, Eskimo and Indian are not generally considered derogatory terms. The term "Alaskan natives" came into use with the passage of the Alaska Native Claims Settlement Act of 1971, and includes all three ethnic groupings.Within those three ethnic groupings, there are seven distinct cultures. These four Indian groups of southeastern Alaska are considered to be a part of the Pacific Northwest coast culture area. Each group speaks their own language and has their own clan systems. The four cultures are similar in the use of art and oral traditions, as well as complex legal and social systems based upon matrilineal clans. They share a similar use of art and are known for their totem poles and dramatic carvings. The Inupiaq & St. Lawrence Island Yupik live in a region that stretches from the St. Lawrence Island to the northern Canadian border and beyond. Their territory also includes most of the Brooks Range.Today, as in the past the food is determined by the region and season of the year. The hunter/gatherer societies is based largely on an active subsistence hunting and traditional use of foods such as, berries, salmon, moose, whale, walrus, seal, duck, and other marine mammals to provide substantial portions of their diet. The Yup'ik & Cup’ik people, named after the two main dialects of the Yup’ik language, live in southwestern Alaska from Bristol Bay along the Bering Sea coast to Norton Sound. The availability of fish, game and plants determined the location of seasonal camps and villages. Yup'ik & Cup’ik are hunters of moose, caribou, whale, walrus, seal and sea lions and harvest salmon and other fish from the Yukon, Kuskokwim and Nushagak rivers. Bird eggs, berries and roots help sustain people throughout the region. The summer and fall seasons focus on gathering food and hunting while the winter season is for traditional ceremonies and festive events. The area stretching from Prince William Sound west along the Gulf of Alaska to the Aleutian Islands is home to the Aleut and Alutiiq peoples. The natural marine environment defines subsistence lifestyles and cultures that date back more than 8,000 years ago. The Aleuts and the Alutiiq differ in language and culture but a commonality was created from the first contact with the Russians in the 18th century that is evident today. 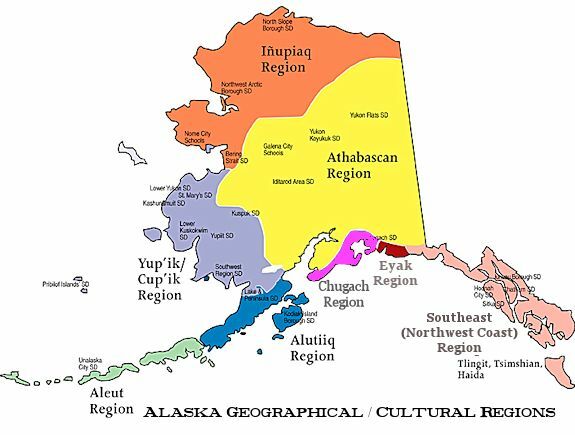 The Alutiiq language, called Sugcestun or Alutiiq, is one of the Yupik branches of the Eskimo-Aleut language family. The Alutiiq are known for their skill in building and handling kayaks or baidarka, as the Russians called it. The Aleut, also known as Unangan, are known for being expert boat builders and sailors and well known for their kayaks. The Aleut language, Unangax, also derives from the Esk-Aleut family. The Baidarka or Aleut kayak was the watercraft created by the native Aleut (Unangan) people of the Aleutian Islands. Two types were created, one with a covered deck that was used as a hunting kayak, and another that was open and capable of carrying goods and people from one island to another. The Aleut and Alutiiq peoples are south and southwest Alaska maritime peoples. The water is their living, whether it’s the creeks and rivers near villages, the shore outside or the vast waters of the North Pacific and Bering Sea. Knowledge of these resources and skill in harvesting them define the cycle of life in an Aleut village. I never know what to say when people ask me about growing up in Kotzebue, Alaska. It’s one of those experiences that is hard to explain, but it helped shape who I am today. Eskimo, Inuit, and Inupiaq: Do these terms mean the same thing?